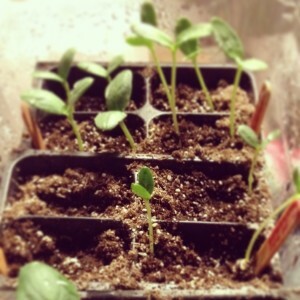 Early Spring - Starting Seeds Indoors! - Make, Mend, Grow. While the rest of the country is buried under a mound of snow, Seattle is basking in sunlight. Spring is here! I have been itching to get into the garden and get ready for what I hope is a crazy long growing season. This year, I am moving my beds around, and turning my entire front yard into a land of raised garden beds-I can’t wait! I’ll likely keep the big bed in the back yard for plants who can’t take all sun, all the time, but look out folks-this year is going to have a ton of produce! I used an organic seed starter mix, and dropped a few seeds into it every inch or so, in little planter cups. It’s easy, fun, and you start seeing your seedlings pop up in just a few days! So, what seeds did I start growing? Let’s start with the tomatoes! Phew…..that’s a lot! I have other things like beans, beets, peas, radishes and some other flowers that will get directly sown into the grown-I can’t wait!!!! This entry was posted in Food, garden, grow, Make, Uncategorized. ← You really are beautiful.